When we returned from our West Coast/Namibia trip last year (http://www.wilddog.za.net/forum/index.php?topic=32003.0), we all said that the next trip had to be an East Coast trip. 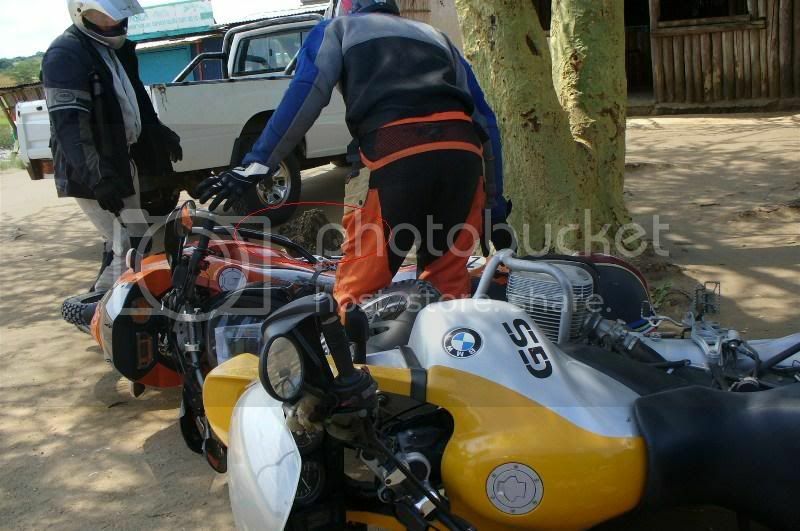 Unfortunately a few other bikers had to withdraw, and so we ended up with only me on Pumba, the 1150 GS (on 99k kms) and Archie on Michaela, his relatively new 950. 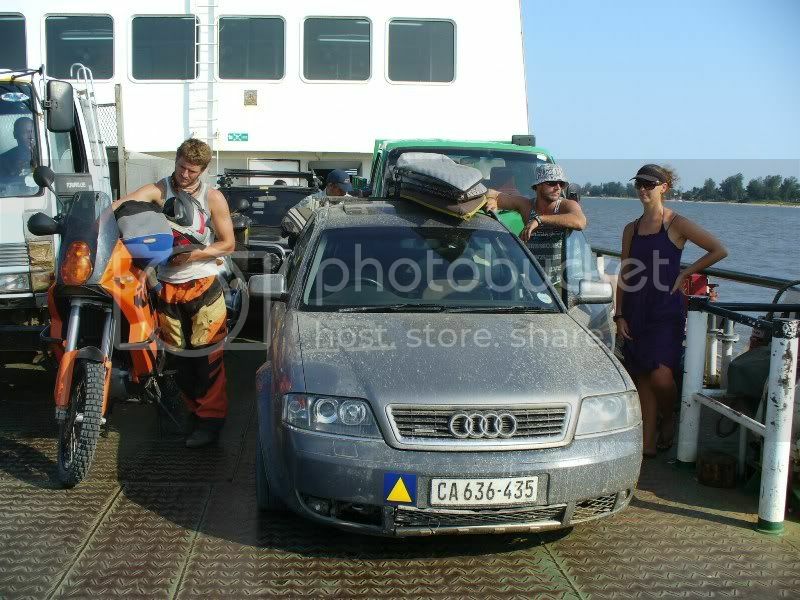 Surf gear, spare tyres, tools, food, water and fuel cans had to be lugged by our crew Amelia, Jacques and Nadine in our newly acquired Audi Allroad. Before the trip, both bikes (new rear wheel bearing for the 1150, and a new starter clutch for the 950) and the car (new CV joints) were serviced, so we were feeling reasonably ready for the trek. So the first instalment of the Ride report ……. There was just no getting away early from work. The crew got away earlier but got stuck in a major traffic jam in Du Toits kloof. Me and Archie only got away just before 5 and burned the rubber down the N1, only to also get stuck in Du Toits kloof, but we were on our way and our spirits were high. 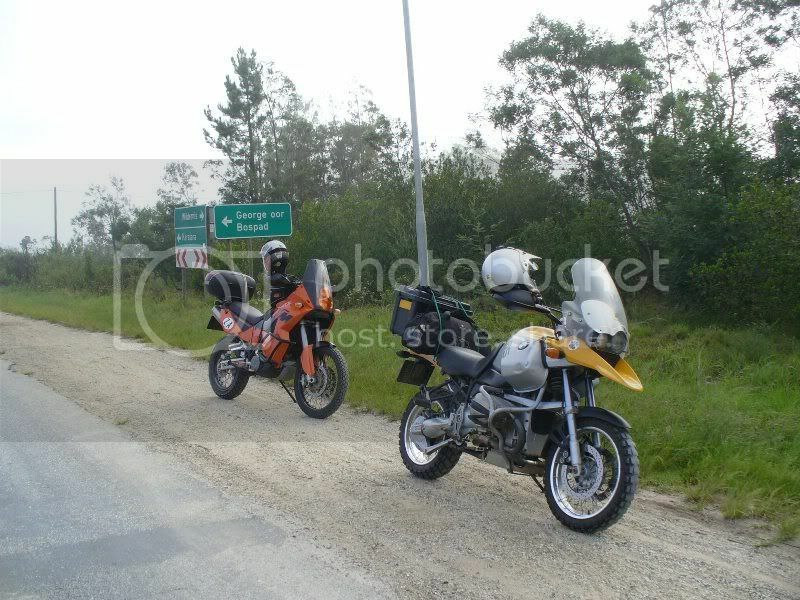 At Worcester we turned onto the R62 towards Swellendam. This pic was taken as we entered Ashton. After a fairly uneventful 5 hours we all arrived safely for a first night on the road. We stayed over at friends’ beach house in Klein Brak, just outside Mosselbay. After an early start, we moved off the N2 at George onto the old George road. This is the old main road from George, a combination of gravel and tar over several old single lane bridges also called the “seven passes” route. This was magic, giving us our first off-road trip feeling. From Sedgefield we tried to do as much of the R102 as possible. 50kms from PE, we turned onto the R72 (with some road works) towards Port Alfred. Close to East London, Pumba tipped over the odometer to a ton (100k kms) and we had to stop for a few pics. At East London we stayed at friends’ flat. It was Archangel’s birthday and Amelia had a surprise for him. 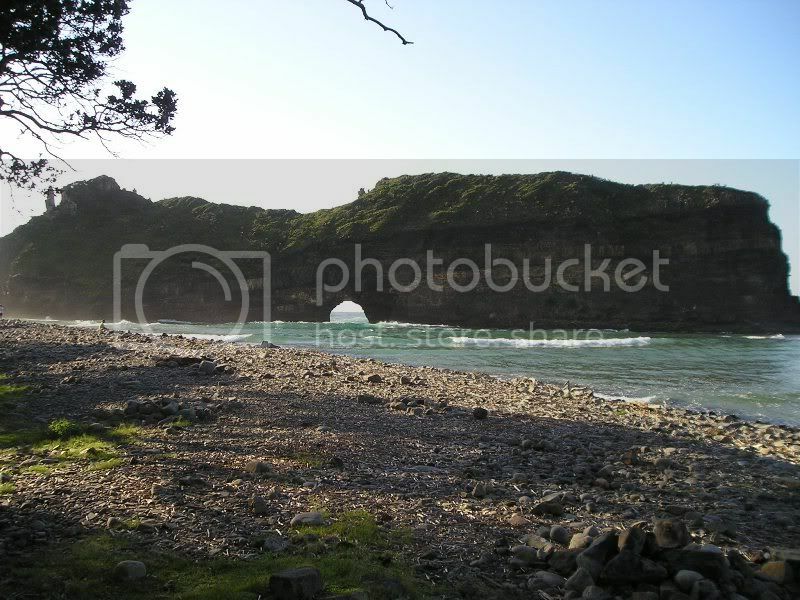 After an early morning surf session at Nahoon reef, we were on our way to Kei River mouth. On our way we saw what looked like a bad superbike accident close to Kei Mouth. 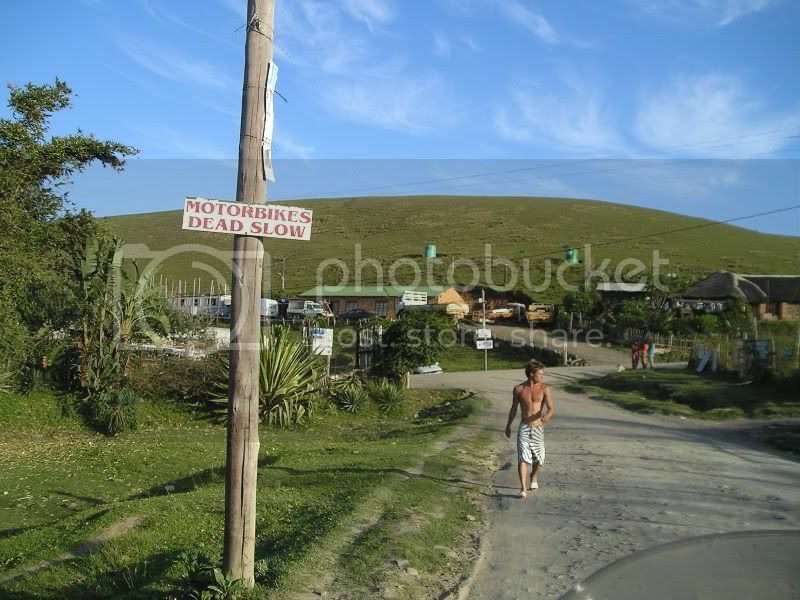 At the mouth we immediately drove onto the ferry, and were transported across into the old Transkei. On the other side, some heavies in Land Cruisers looked us up and down, remarked on how bad the roads were and that we were in the wrong place. Anyway, we continued along the first bad gravel parts onto Centane. Chatting to the people at Centane, we were told that the bridges on the direct route to Coffee Bay were washed away. 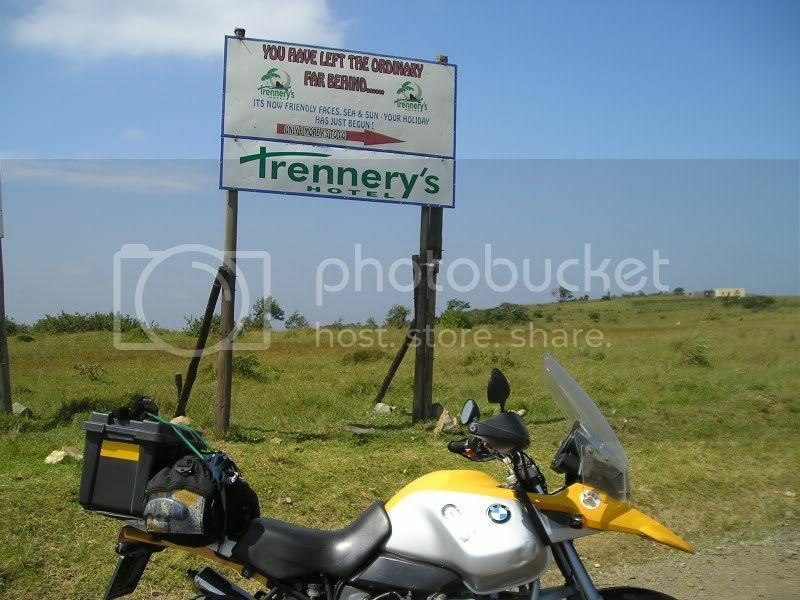 So we turned West towards the N2, North towards Mthatha and eventually East towards Coffee Bay on the tar road. 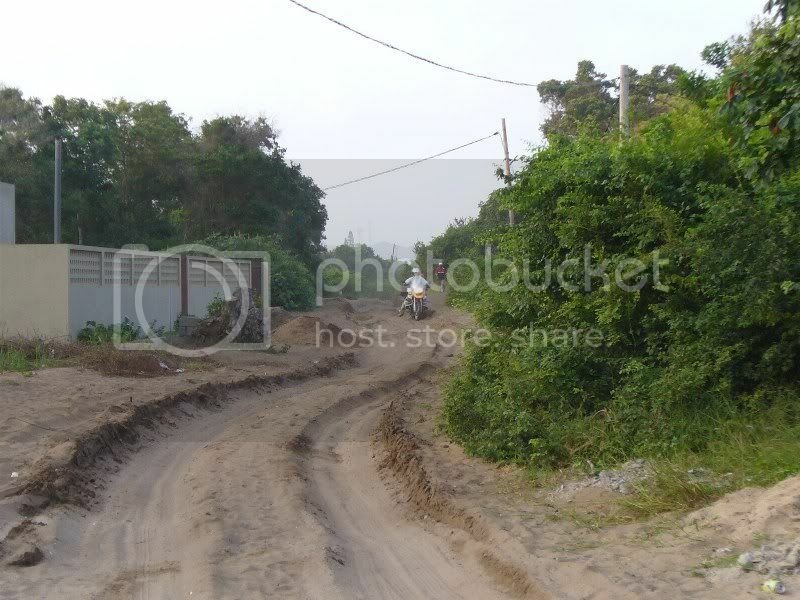 This road deteriorated with potholes until we had to slow down to 20km/h weaving from side to side to find a route, dodge cattle and oncoming taxis. We decided to call this road the one to Potty Bay. From Potty Bay it was a short but beautiful 10 kms to the Hole-in-the-Wall camp site, where we pitched camp in a roaring wind. Two tents did not make it (tears and broken poles), and we ended up with only 2 out of 4 tents. 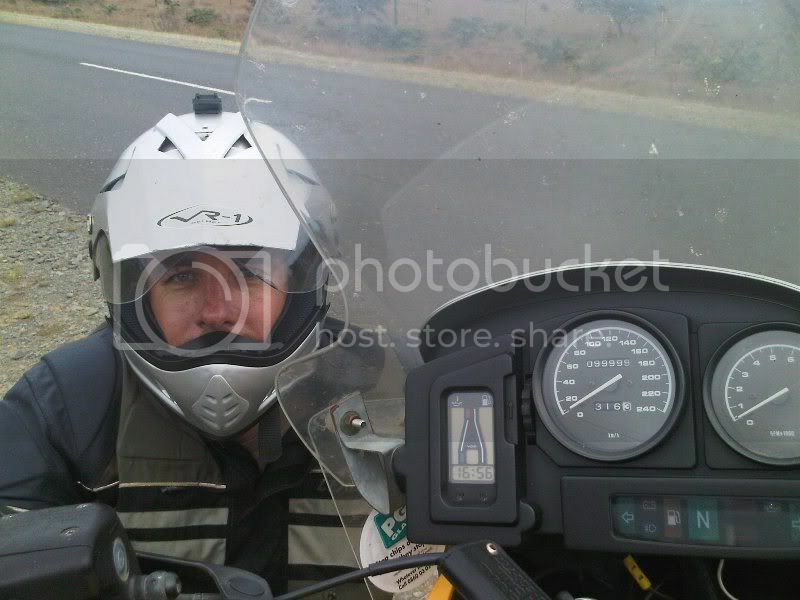 We were supposed to get petrol at Coffee Bay, but alas, the pumps were bust and the KTM and car were close to empty. We did not anticipate fuel issues and did not fill our jerry cans. With the new GSA tank, Pumba of course did not have a problem. 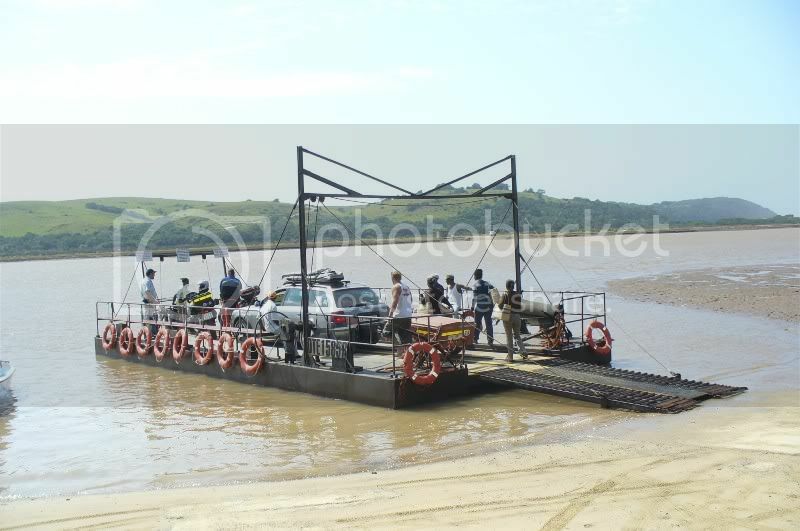 The trip for the day would only be about 30kms so it was not a problem yet, but the next day to Port St Johns would be. So while Archangel and crew travelled to Mdumbi, Pumba the tanker, got strapped with jerry cans and jogged past the potholes 80kms to Mthatha and back to alleviate the fuel shortage for the next day. 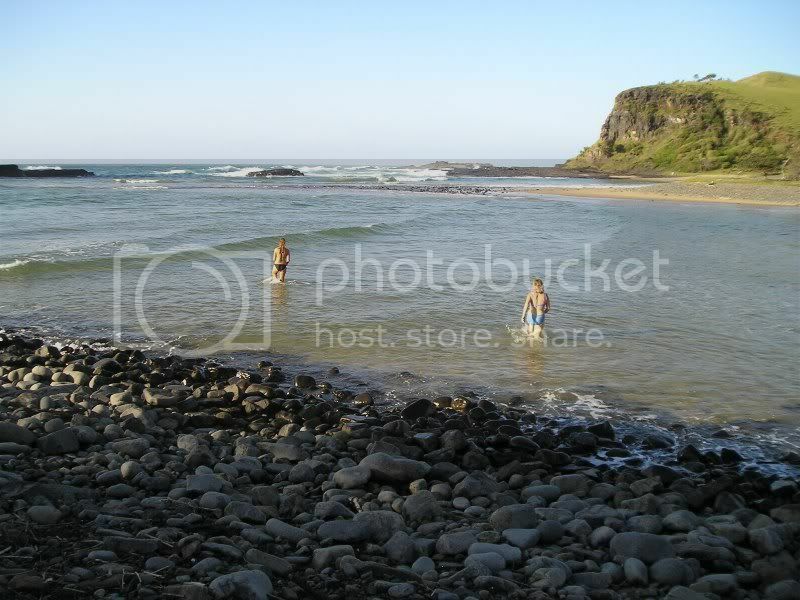 At Mdumbi we all went for a surf and relaxed by chatting to the locals. At Mdumbi we met Johan. 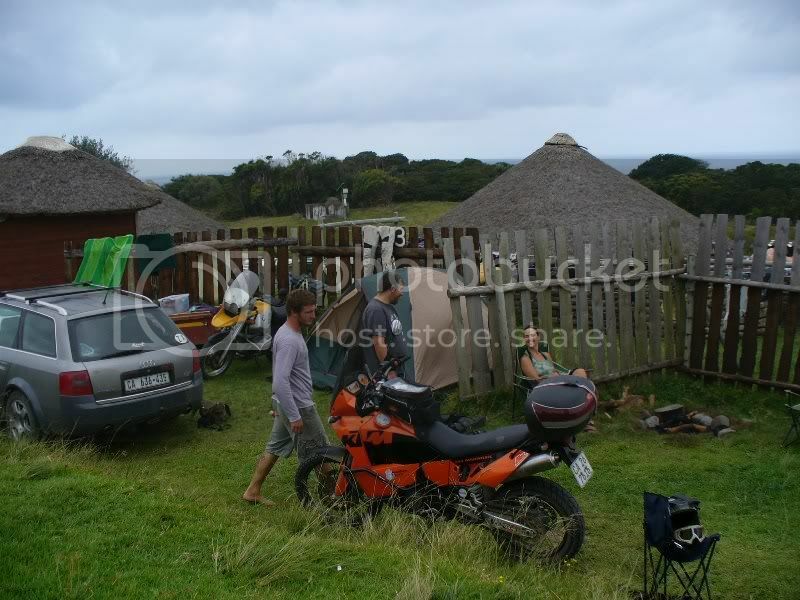 He is one of the owners of the Mdumbi Backpackers and co-founder of the TransCape NPO working in the area. He has a radical Honda AT with huge plastic tanks with which he toured Africa and Russia/Asia more than 100k kms on the clock. 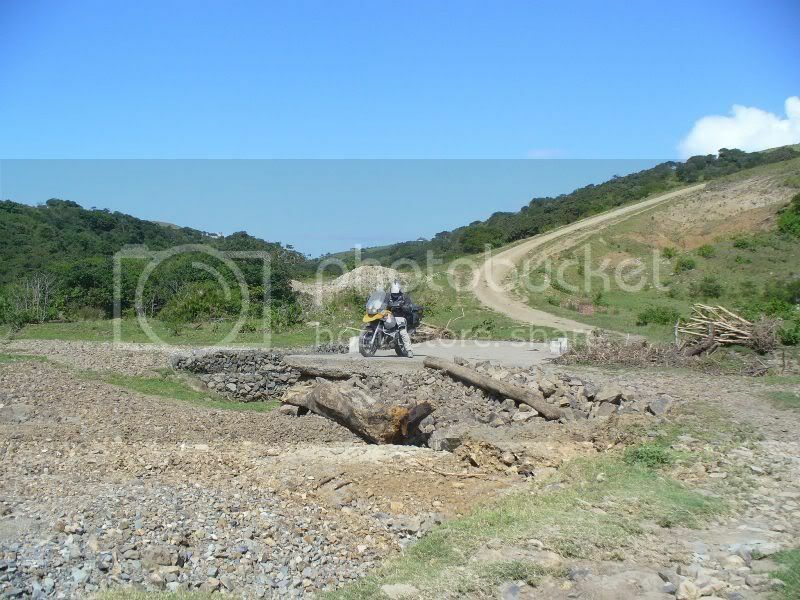 Johan helped us to plan a nice scenic route to Port St John, despite the map warning of “Bridge washed away”. After a magic morning through the Wild Coast jungle roads, we reached Port St Johns by lunch, but not before the crew’s car gave a few splutters due to fuel shortage. From Port St Johns we turned onto the R61 towards Lusikisiki, through Flagstaff, Mbizana and eventually on to Port Edward. The first part was a spectacular pass, long sweeps with a good surface and a real treat. There were huge traffic jams in the centres of the little towns which really look like being in the middle of darkest Africa. 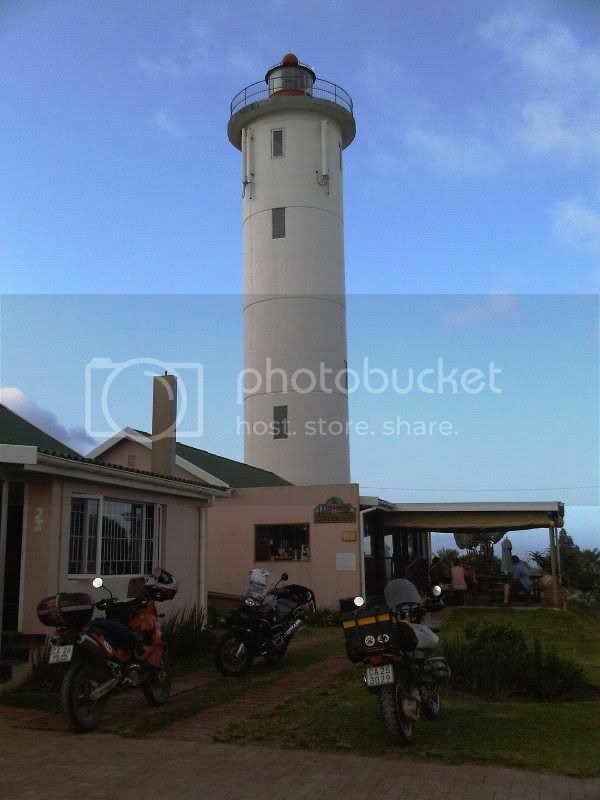 At Port Edward we met Dave “Lighthouse Keeper”. This was really a highlight and Dave’s hospitality blew us away. Thanks Dave, we owe you !! Hope you recover soon !! We left Port Edward early and sped up the N2 towards Durban and on to Pinetown. Archangel organised with Marshalls Motorcycle shop to fit a new set of TKC80 sand diggers for the Mozambique part of the trip. We arrived at Marshalls at 9 am but they did not have the tyres and so we had to wait 2 hours for the tyres to arrive. We used the time to have the crew’s car checked out. We phoned Marshalls to be told that the rear tyre was on and so we chased back to get the bike and to get going. When we got there after an hour, we had to wait another two hours while they took lunch, midway in fitting the front tyre. Unknown to us, and unwanted time wasting, they also washed out bikes. In the end, it took Marshalls close on 5 hours to fit two tyres!! I was not amused. From Durban we ran along the coast up the M4/N2 to Hluhluwe, where we turned east on the R22. By this time it was dark, (due to our looooong pit stop in Durban!!!) and we missed the scenery. It was also very dangerous as there were cattle along the road and Archangel narrowly missed hitting one. We eventually arrived at our stop with friends at the Manguzi mission station at Kwa-Ngwanaze at 9 pm. We were very excited to eventually get to Mozambique!! After filling up with fuel and water, we approached the Farazella border post with excitement. Border formalities were quick and friendly with a lot of banter about our crew’s Audi not making it to Ponta. Our hosts at Manguzi explained that after passing through the border, we had to keep taking the tracks to the right and keep to the ones most used? How’s that for directions. 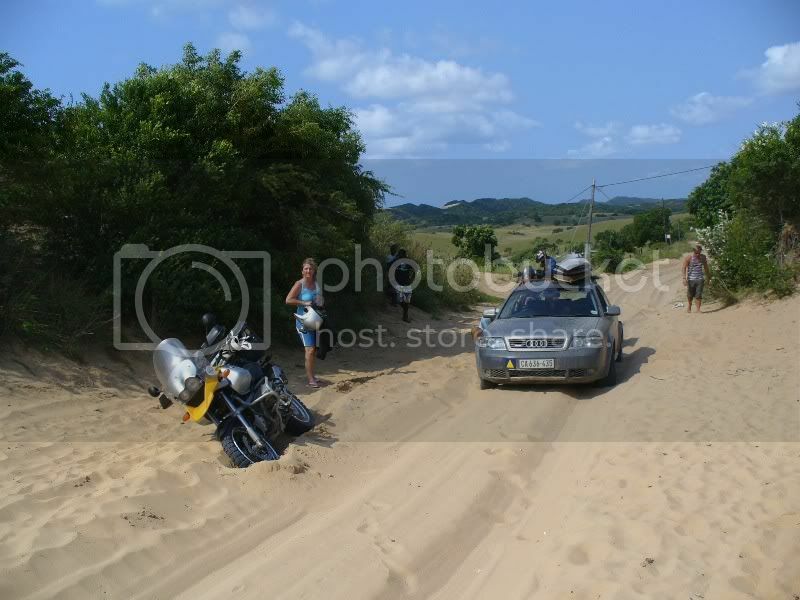 It turned out to be quite good advice and so we were on the highway to Ponta du Ouro! Archangel had the first dunk (un-captured on film) and I soon followed. I was quickly helped upright by some amused locals. 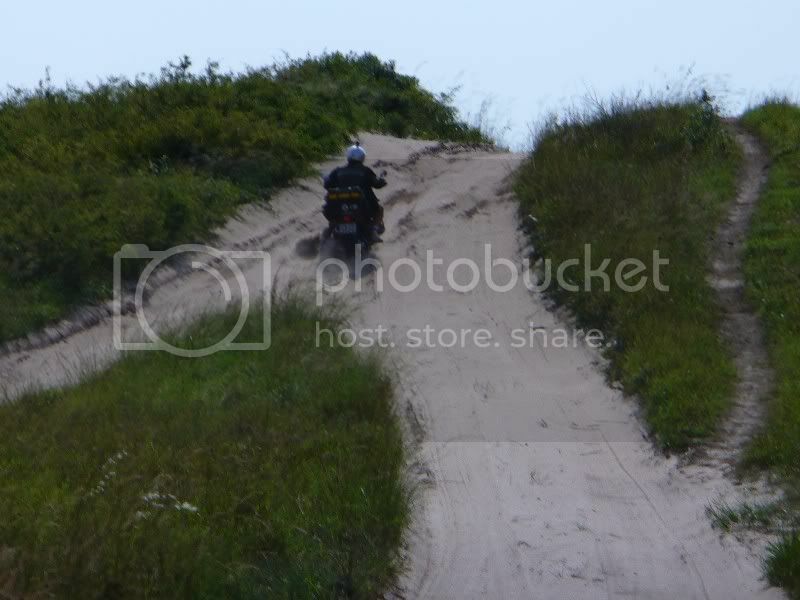 My full 30L fuel tank did not make this my easiest sand passage ever, but we laughed a lot. It was also blistering hot and our cloths were drenched. 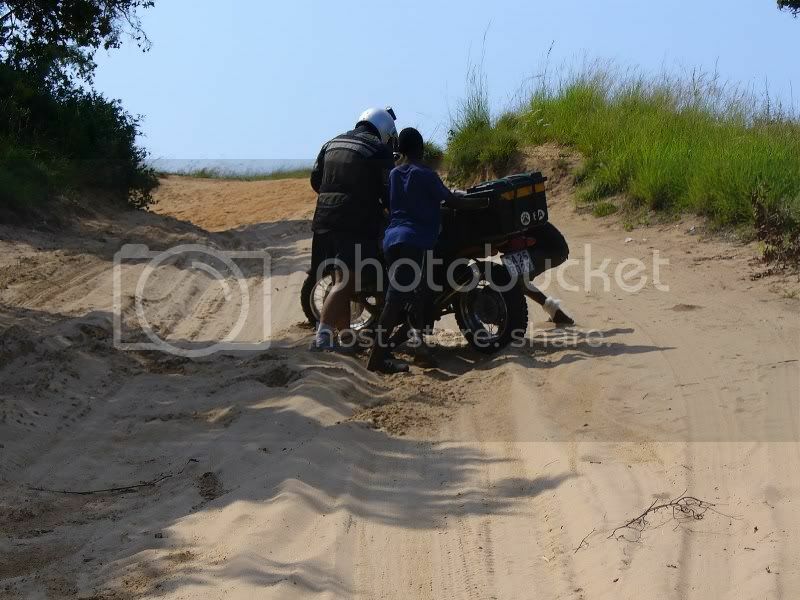 At the last dune before Ponta, I dropped Pumba again and the crew had to stop to avoid driving over me which lead to them getting stuck. We were soon approached by a friendly truck driver that pulled the car out in two ticks. We were very relieved to eventually get to the camp and pitched our tents close to the breaking surf. 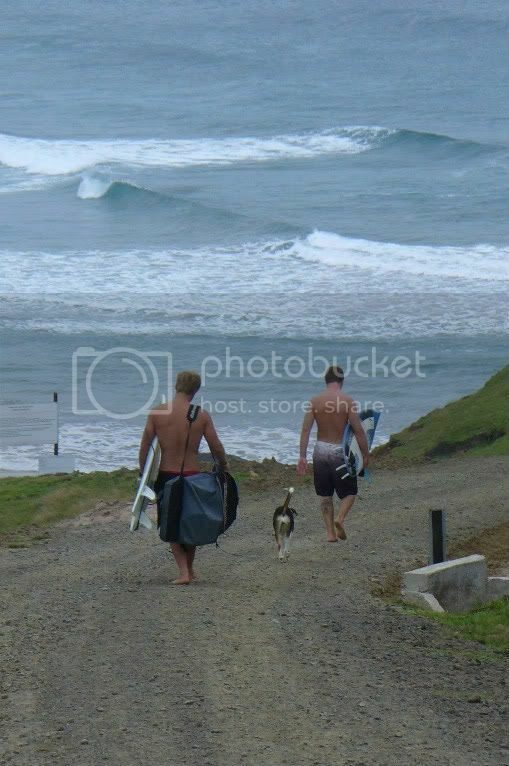 After a surf session and nap, Archangel and the crew went to explore the neighbourhood. This day turned out to be the definitive day of the trip and made this an adventure with a big “A”. Archangel said that a trip is not an adventure before something breaks. 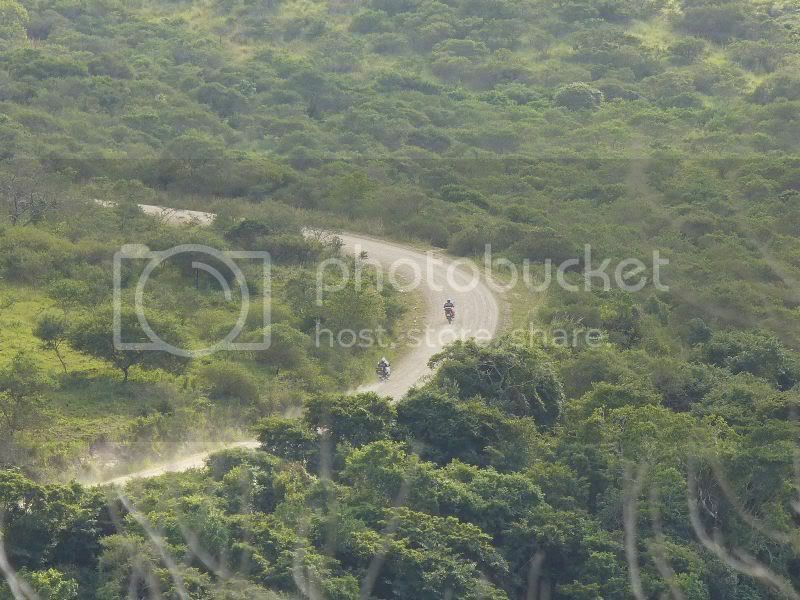 The route was: 10kms to Ponta Mamoli on a similar sandy track to the previous day and then along the edge of the Maputo Elephant park towards Maputo. 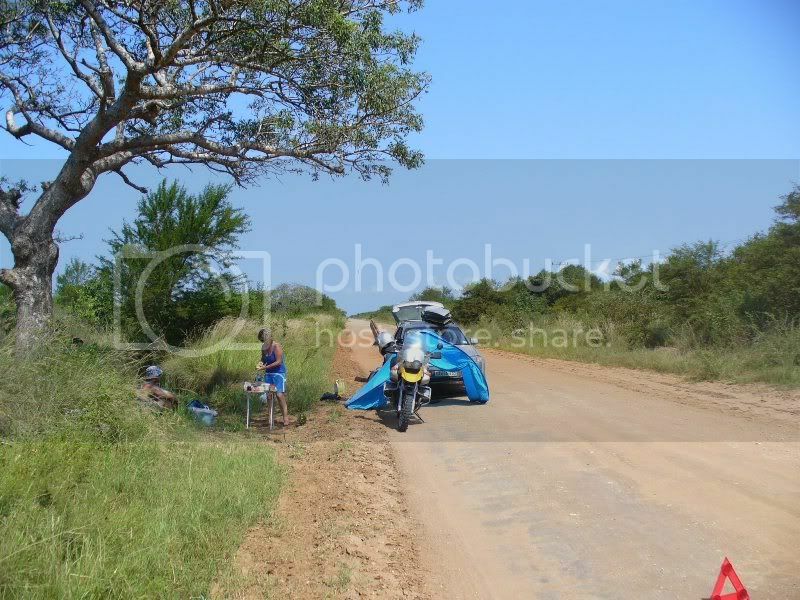 We were aiming to get to Xai-Xai another 100 kms north of Maputo. After the previous day's heat, we decided to get away at 6 am. This did not help as we were already sweating like pigs, even at that time in the morning. 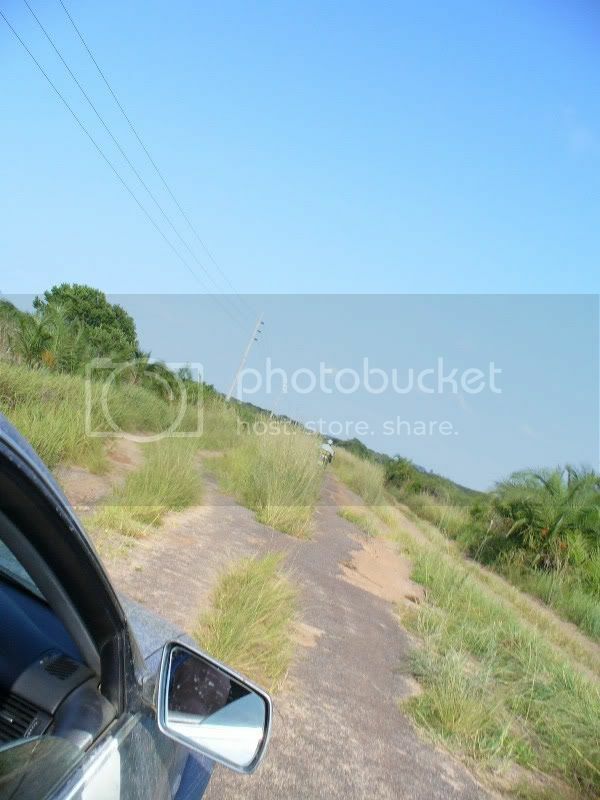 As we were worried about the car getting stuck, we decided to follow the car for the first part of the route. I was grinding in first gear mostly, stopping every 500 meters to regain my breath from guiding/wrestling Pumba along the track. After 8 kms I saw the car’s belly pan lie in the track which was worrying as it meant that there was something wrong. 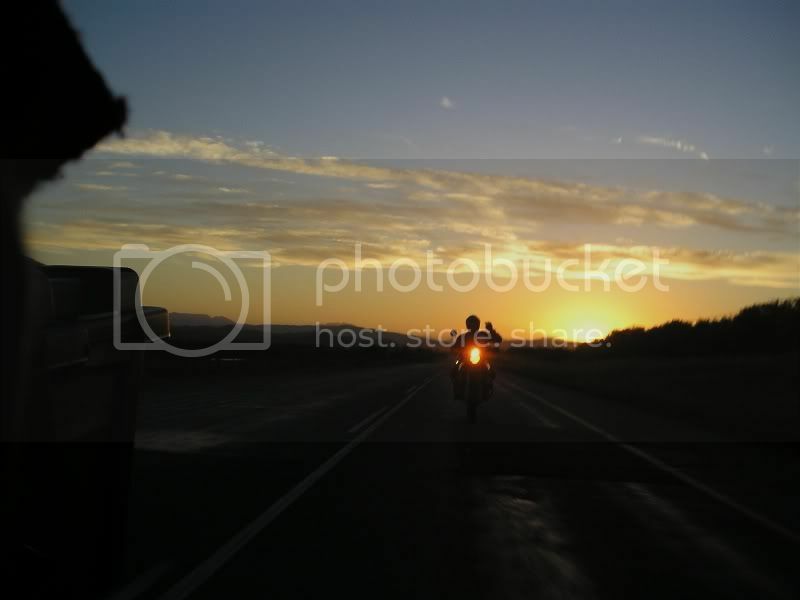 Archangel strapped the pan to his bike and we caught up with the crew. 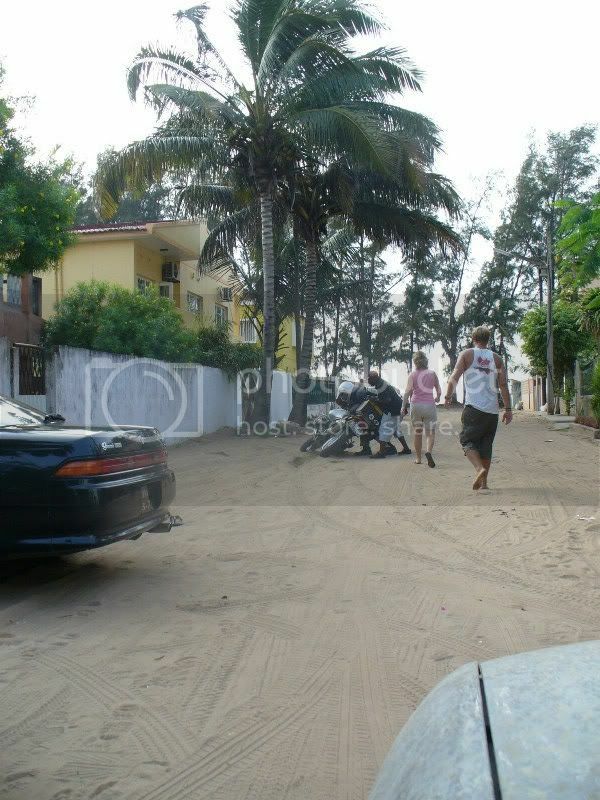 The Audi’s nose was lieing on the sand, something with the air suspension went seriously wrong. 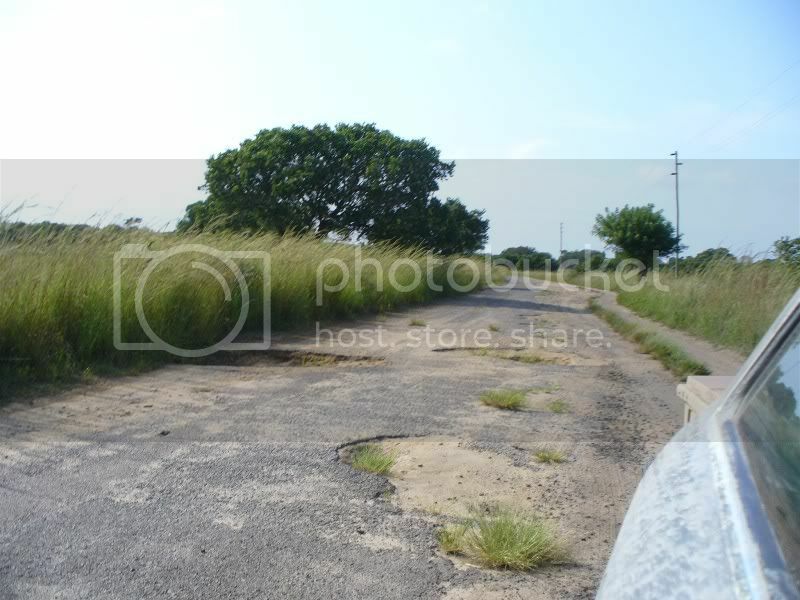 Now Amelia had to guide the car to ride with one set of wheels on the side of the track and the other on the middle-mannetjie to keep the front from scraping. After a few kms just outside Ponta Mamoli, we came to a tar section and thought that we were saved. It was already 10am which meant that it took 4 hours to do the first 10kms of the day and it was humid and in the high 30’s. This tar section was so bad, that we were forced to ride beside it most of the time. While driving on this section the crew suddenly heard a load hissing sound and lost power. After investigation I found that a hose clamp of a turbo pipe got pulled off by the constant scraping. Cable ties were used as a temporary solution, and we were moving again, but we were back to sand again. After getting stuck a last time, and being rescued by some locals with a 4x4 pickup the track started to get better. At Bella Vista we stopped to regroup. 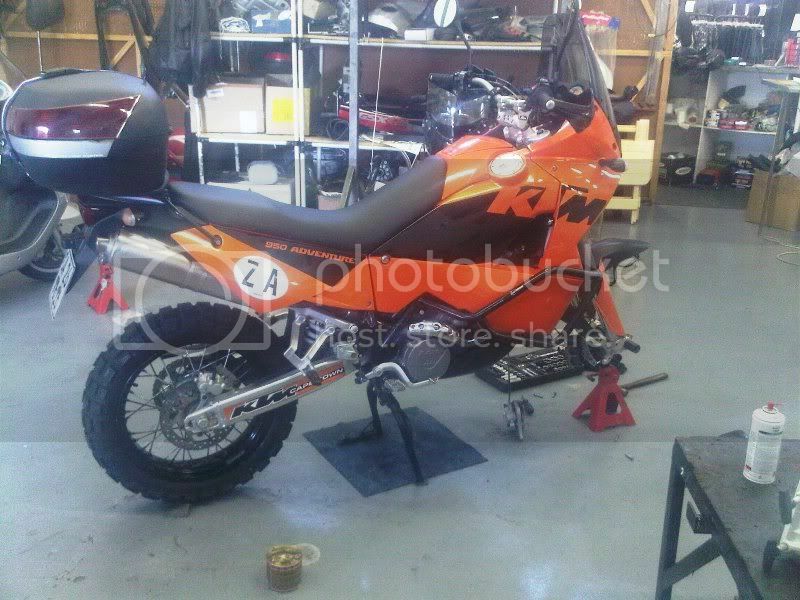 As we wanted to pull away, I was suddenly struck by a KTM and tumbled to the ground. Archangel forgot the tree stump next to him and got bumped off balance at take-off with a dominos effect. What next!! Just after passing the Maputo Elephant Park, which does not have fences btw, I stopped to check on all. We had 15 kms to go to Maputo. While having some water in the shade, Jacques noticed some oil dribbling from the car. It bumped a hole in the sump on a rock and we were losing oil. This hole was plugged with good old Pratley Steel, and a good thing that we had a 5L oil in the trailer to re-fill the engine again. 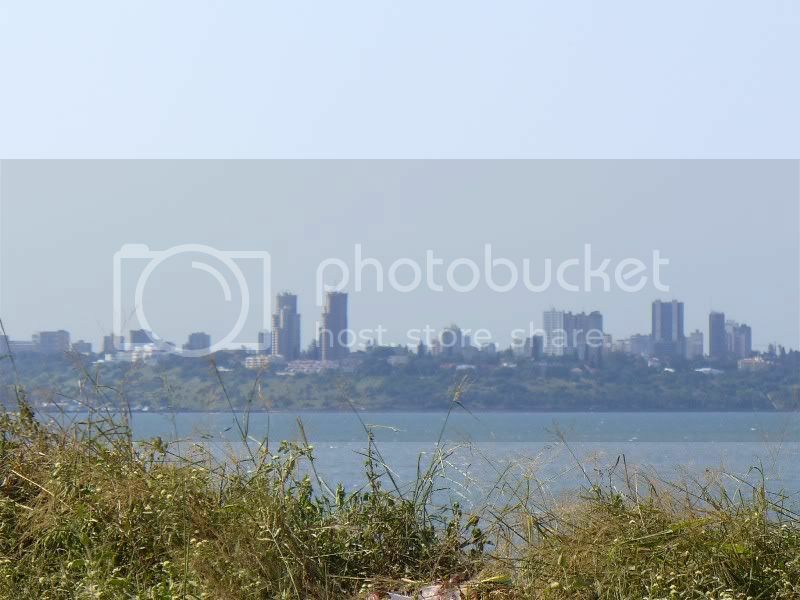 We eventually arrived at Catembe at about 3pm, just on the Southern side of the bay and we could see Maputo. 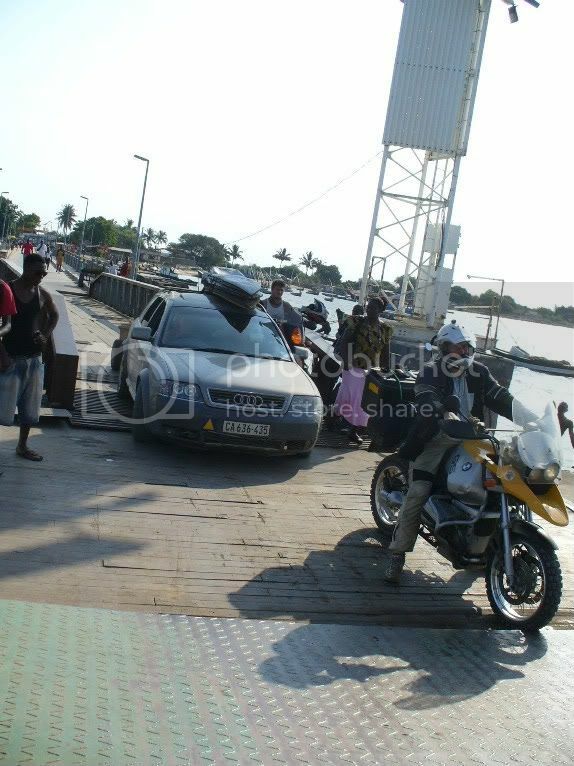 After the short 500 meter ferry trip we were in Maputo, 4pm on a Friday afternoon, in peak traffic. We were stopped by a few military guys with AK’s, alleging that we drove up a one-way, demanding immediate payment of R500. Again Archangel’s negotiation skills got us away, without paying this time. With the sun setting quickly, we went about looking for a place to stay. We soon learned that there is no campsite in Maputo and we opted for the Maputo backpackers, all 5 squeezing into one room, but glad to have a place to lay our heads after a very long, hot, stressful day. We took 10 hours to do the 120kms. We parked the bikes and rushed to the beach for a dip in the warm ocean. After the dip, the young ones went to taste some of the street vendor’s treats, while older ones relaxed with a beer, what a day !! We were scheduled to go further north for another day, but after a group meeting, we realised that the car was not in a state to continue off-road and thus decided to rather turn west towards Nelspruit along the toll road. Leaving the backpackers, I was looking in my mirrors to see if the car was following, hit a sand hole and dumped Pumba, 10 meters into the day's trip !! After 100kms we went through the border post and were back in SA. After a quick visit to the Nelspruit Audi, it was confirmed that it was the front air spring that burst and they did not have the part in stock. We proceeded to a friend’s house at Witrivier where we stayed the night. 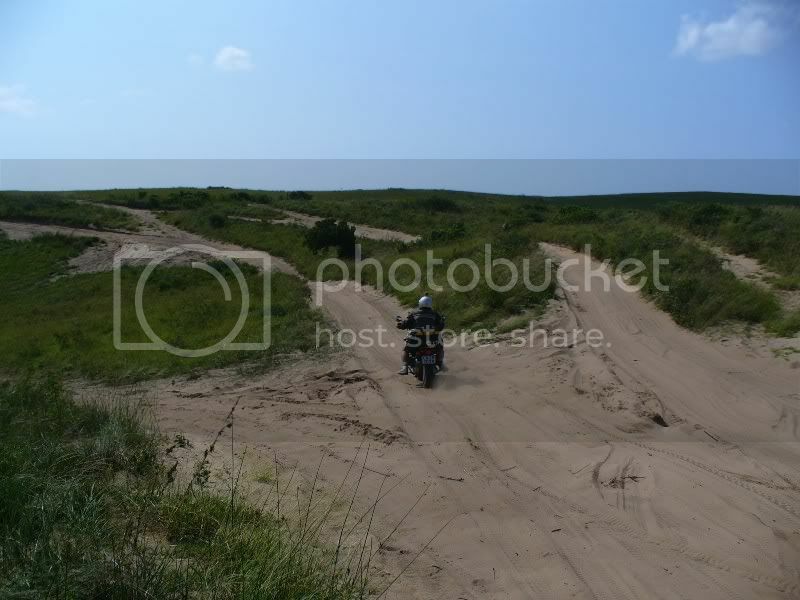 Very exciting, lots of loose sand! Looking forward to rest of trip! WOW!! Adveture with a moerse big "A"
Pragtag!!! Nice man. Bly julle is veilig terug en julle het so uitgesien na die trip. Ja nee, daai geel varkies is glad nie lig nie en toe gaan maak jy hom mos swaarder. Nice trip en RR julle Melkbossers! Bly julle is almal veilig terug. Kie Mouth and didn't check out Wakky Piont. When that spot works it's like a mini J Bay. few lesser known surf spots. Cool trip! How's the Audi holding? Definitely displayed some perseverence there. Staying in Worcester the past 3-years, only thing I miss is the 2/3 surfs a week. They are very sand capable!